I know there’s been some debate about the authorship of the Little House on the Prairie books and how involved Laura’s daughter Rose was in the revision / editing / writing process. Honestly I don’t need Laura to have written the series solo: I will always find them to be amazing books, in particular the beloved third book in the series. 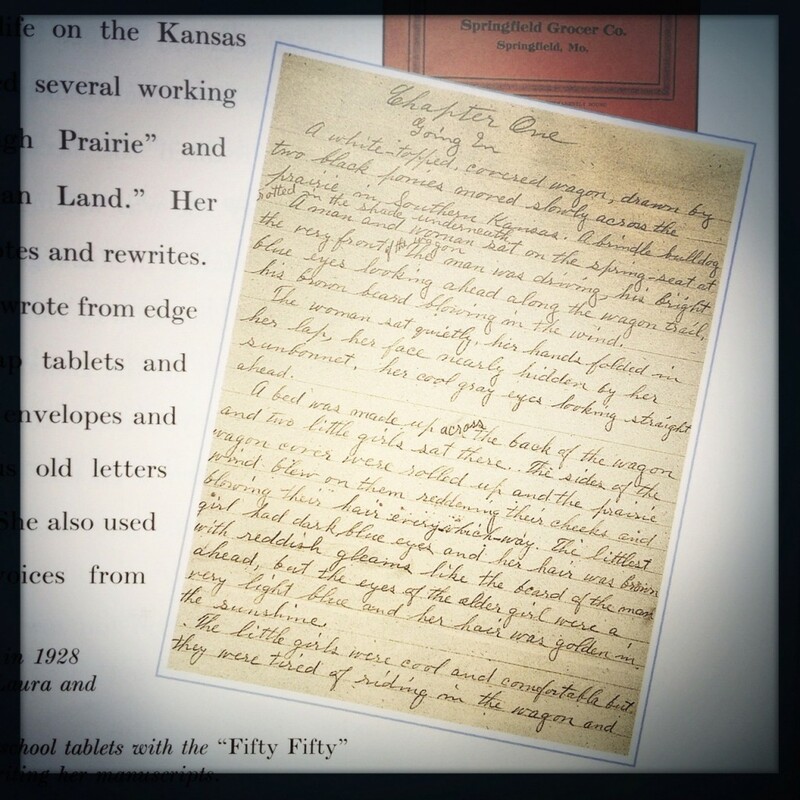 In the back of my 65th anniversary edition of Little House on the Prairie, there’s a rather light-weight essay by William Anderson, but what I found most interesting was a photograph of the first page of Laura’s hand-written draft of the book. Not to be too cruel to Laura’s writing impulse — and we all know that we aren’t supposed to judge our early drafts, right? — but this early draft is pretty bad: flat, cliched, and stylistically bland, and obsessed with the hair and eye color of her characters. While the published opening, in comparison, sparkles–the voice so much more authoritative and confident that you have to read on (in the published version, even the paragraph breaks seem expertly done — the dramatic one sentence second paragraph makes you sit up and pay attention). If Rose’s involvement allowed Laura’s original language and story to be transformed in such a way…well, I’m really glad Rose was involved. Stumbled upon this scene of literary happiness when getting back from a walk one morning. Note in the second pic the last remaining butternut squash of winter, which I had to sacrifice to Stella so she could have a squash companion for the spring. It was a big sacrifice as I really love eating squash. The book Jasper is reading: Sophie’s Squash, about a girl who has a pet squash. I just finished up reading Little House on the Prairie to my daughter Stella. 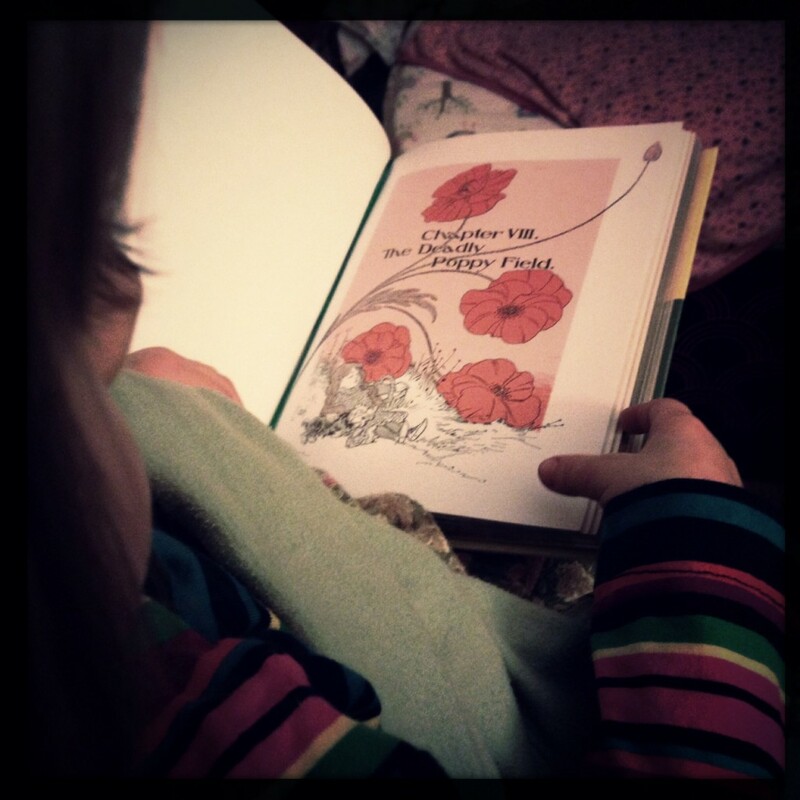 We tried reading it last year, when she was three — I couldn’t hold myself back any longer (enough rhyming repetitive picture books! ), and it was a bit of work for both of us. But 4 1/2 years is the perfect age, I think – and it helped that we were reading from this lovely collectors edition with larger, full color pictures. What is Laura doing now? I’d ask Stella. Let’s find out. And Stella would climb onto my lap and we’d read a few pages or a chapter together, Stella remaining intensely focused during these reading sessions. I wish I could have seen inside her mind. I wish I could re-experience hearing this book again for the first time. The New York Times had a pretty interesting article about the history of first person shooter games a while back. But I was surprised Choose Your Own Adventure books didn’t come up in the article. Though I tend to lean rather anti-technology on the spectrum these days (no time! ), I did spend a lot of time in front of the computer in the 1980’s and early 1990’s playing old school computer games. I’m pretty fascinated by the development of games up until a point where they get too polished (interesting exhibit: The Art of Video Games, which was touring the art museum circuit last year). As a kid, I spent a lot of time with Infocom games (all text games which you can now apparently play on your iphone – weird), then moved up to King’s Quest and the Bard’s Tale, and then I just found other things to do, like write stories, get a job, and have kids. But before all that, there was this golden time (in my mind) pre-computer, where it was board games and books, until the ColecoVision came into our house at least. I was a somewhat obsessive reader as a child. I remember writing out a list on paper with a pen (this was pre-computer) of every single Choose Your Own Adventure book and then methodically working down the list–and, in addition, methodically working through each book so that I took every possible path, until the entire series was read to my satisfaction (check out this pretty interesting history of the series). I loved those books. I think you can get the same thrill from them as you do playing King’s Quest for instance – finally there you are, wandering through a strange world, able to make the life and death sort of decisions that you as a kid never get to make in real life (i.e. if you try to return from the future by activating the chronistan, turn to page 108. If you wait to see if you can find a less risky way to return to Earth time/space, turn to page 111). So it was somewhat of a shock when Jasper unearthed my old Choose Your Own Adventures and I began reading to the kids only to find they’re just really….bad. The writing is devoid of any beauty or even at times coherence, perhaps because of all the jargon put in or else it’s trying to condense a complicated plot into such a brief space (example from House of Danger, #15: “Several thoughts spin across your mind. Was that man Henry Mardsen? Was it his house? Was he a counterfeiter? Or was he trying to escape from counterfeiters? Trying to escape seems more likely. And what about those chimpanzees? Could there be a counterfeiting animal trainer?”). They can be somewhat violent. 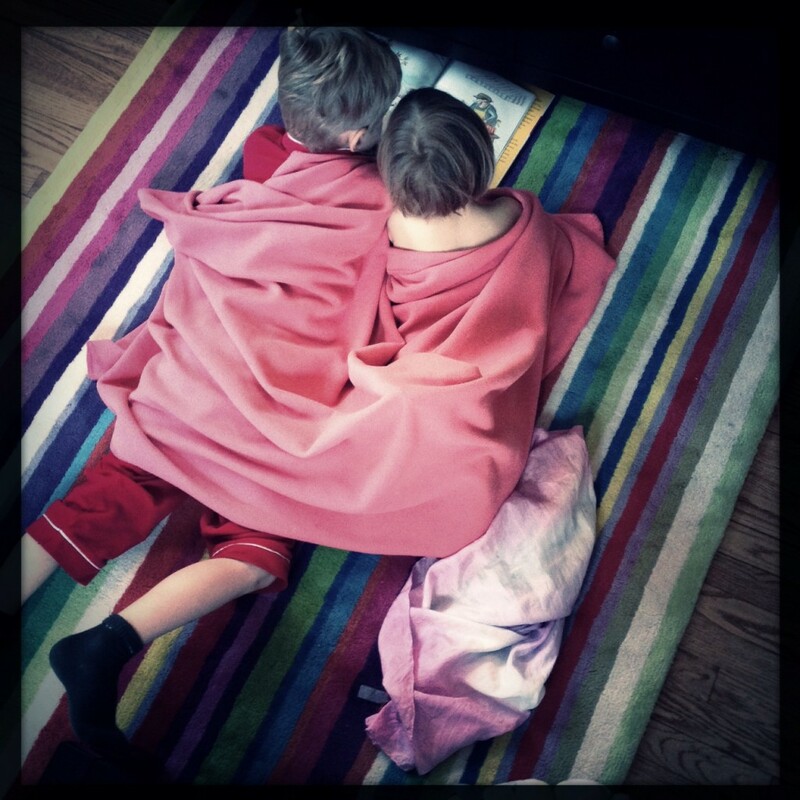 When reading them, I find myself longing for the story to end now please, perhaps even making bad decisions (when reading to the kids, we all take turns picking what to do) so that it could be over sooner. But I don’t think the books were written for me. My 7 year old loves them. For about two weeks straight he curled up on the heater and read through every Choose Your Own Adventure we had in the house. It’s sad, to me, that the pleasure from these books is now inaccessible for my overly critical adult brain. But it should probably be enough that my kid is really loving such books as much as I once did. I would venture to say back then there were less crossover with children’s and adult literature. My parents certainly never cracked open a Choose Your Own Adventure and I can kind of see why now. It’s nice in some ways I suppose (and a little bittersweet) that there are books out there whose joy is only available to you once when you’re young enough. 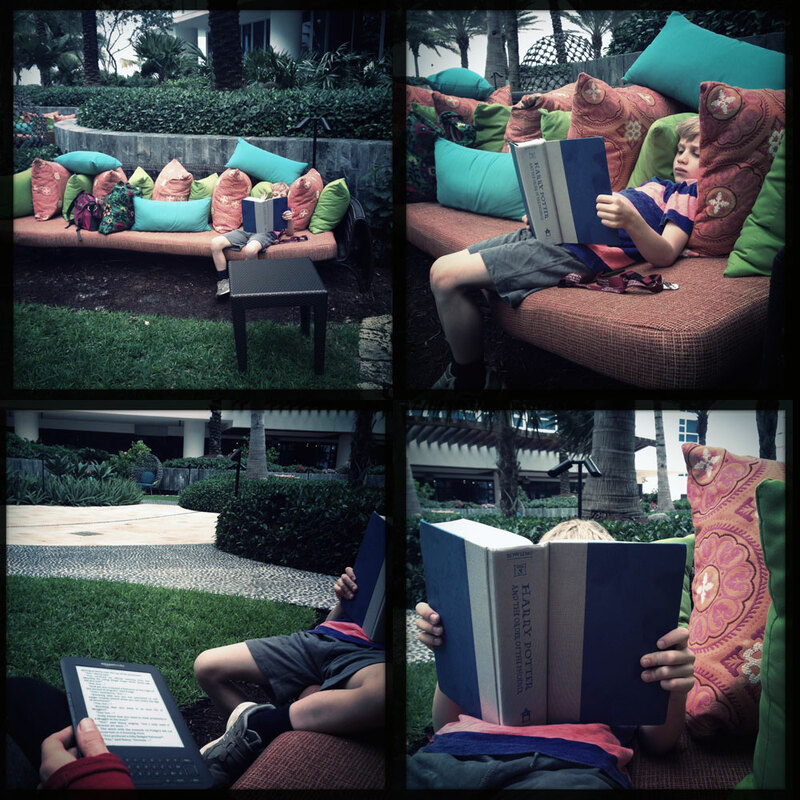 One of the best moments of the previous year: reading Harry Potter (#5) along side my son during vacation in Miami on top of some very nice pillows. I can honestly say life can not be better than this (they were really nice pillows). 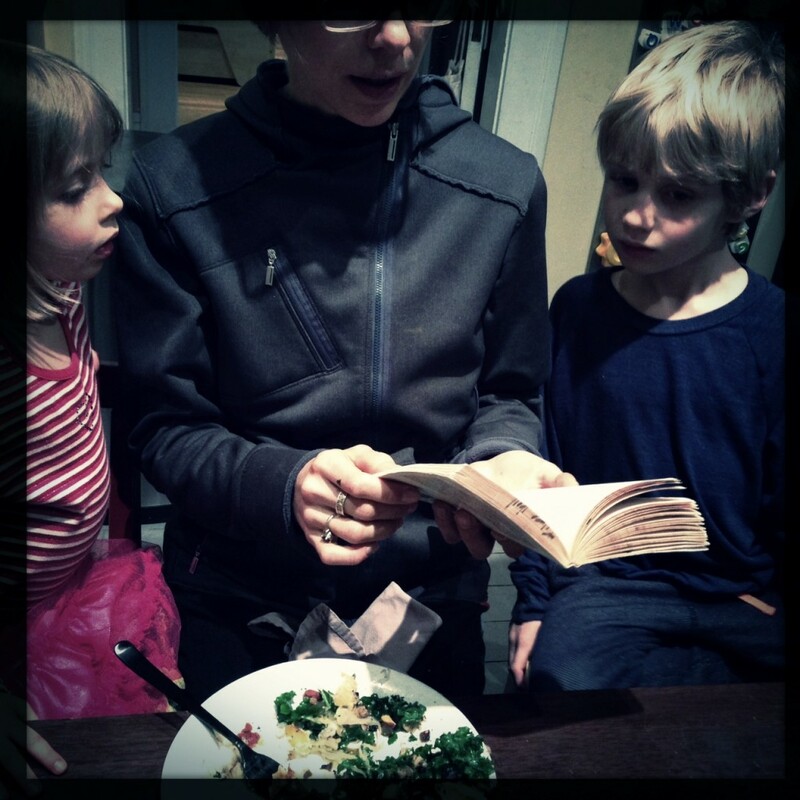 I recently overheard a tired mom saying, “I am just over reading to them, you know? I am just over it.” And I thought, rather haughtily, sure, how could a person say that? 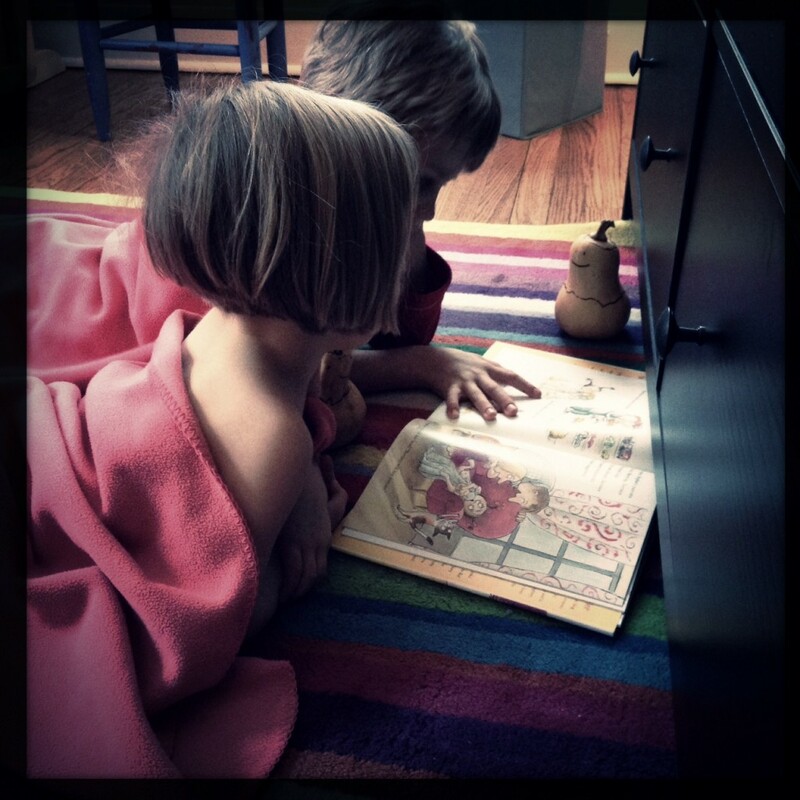 Reading to my kids, or with my kids, is honestly the highlight of my day. Without that time we would just have….the day. No wizards on brooms, no secret wardrobes taking you to another world, no funny elephants, or talking pigs, or serious turtles who have to go the hospital because they broke their shell, or dark forests. I think I just really enjoy reading though. I understand the mother’s sentiment of course, because it does depend on the books–reading Stella the Rainbow Magic fairy series, of which there are more than 150 (gulp), okay, maybe I’m a little tired of those, but reading The Year of Billy Miller (about a second grader who had an accident over the summer and has a dreamy little sister who bothers him sometimes) to my son (who will soon be in second grade and had an accident this summer and has a dreamy little sister who bothers him sometimes) is just unbelievably….perfect. To keep my enthusiasm up, I take turns picking books with my 4 year old: she picks a book, often of dubious literary quality but one she loves, then I get to read her some of a longer chapter book. When I started staying home with the kids to write more and see them more, I thought I would be a mom who takes their children out on adventures and makes really complicated crafts. But I’ve found that pretty much all we do is a lot of reading and cooking together, and that’s enough. Before I had kids, I reread the Wizard of Oz and felt it didn’t hold up as well as some other childhood favorites like Little House on the Prairie or The Book of Three. But reading the book to Stella (our second time through!) 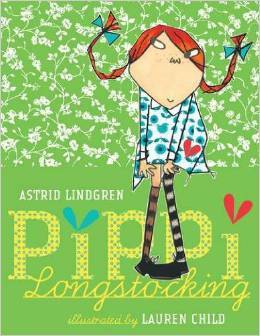 I realized how much better the story works when read aloud to a 4 year old. We have the 100th anniversary edition which is a facsimile of the original first publication – the pages are covered in illustration (sometimes overly so, as on occasion the text is hard to read!) but they certainly keep a child’s interest. It’s pretty magical trying to imagine back to Stella’s first time hearing this story–tornados can take you up into the air to another world? There can be yellow brick roads to discover which will lead you on an adventure? Young girls can get rid of terrible witches and then find their way back home again? I did try reading the second book in the Oz series,The Marvelous Land of Oz, to Stella not long ago but stopped after the first few chapters–it seemed a scattered, strange book meant for perhaps for older children. And where the heck is Dorothy in that book anyway? Better to keep rereading The Wizard of Oz again and again. While I love reading Harry Potter…. It’s even better reading it alongside your child. 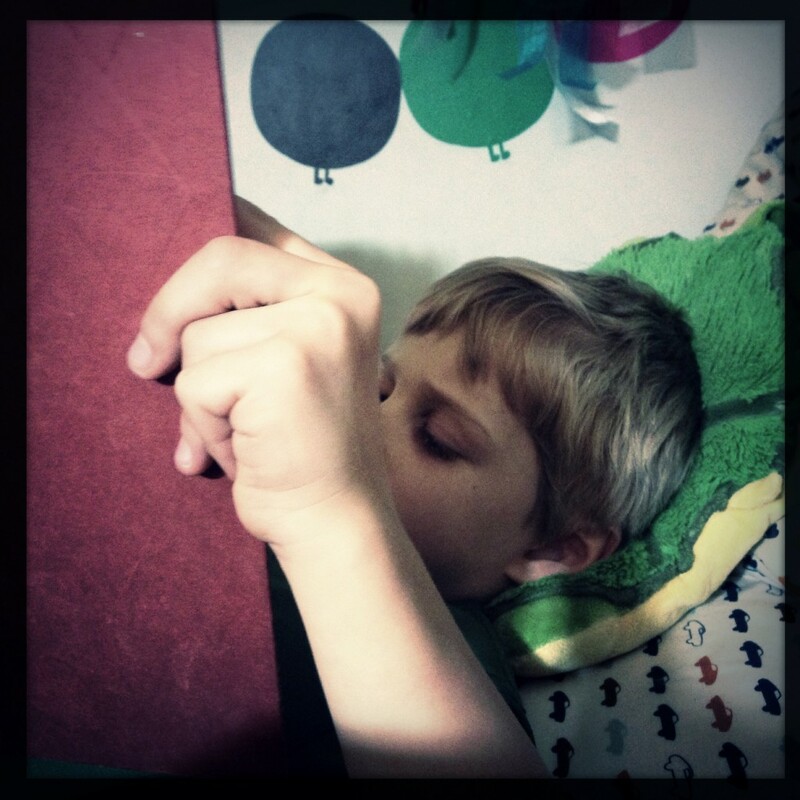 Honestly it’s often my favorite time of the day – between 7 – 7:20 p.m., when I get to lay down next to my son in bed and read a chapter of Harry Potter alongside him. It’s like getting to share a really good dream with somebody, which never really happens. I’ve read the whole Harry Potter series through maybe 3 times by myself now and, despite what some other writerly folks think, I still find them magical, engaging, funny, heart-felt and sincere. I told Jasper how a friend’s child is expecting to get a letter when she turns 11 saying she’s admitted into Hogwarts, and Jasper’s eyes opened wide. “Will that really happen?” he asked. I said who knows. Maybe there are some underground wizardry schools out there and we simply haven’t been invited to them yet. I’d like to live in the world, or have my son live in that world, where such a thing could happen. We’re on the fourth one right now – Harry and the Goblet of Fire — the last one before the books get very very dark. Jasper loves how long it is (734 pages!). This is a great book to read alongside more adult literature like Alice McDermott’s Someone, which is what I’m doing now. Harry Potter reminds me why I love reading (it’s fun, it’s wild, it can transport you to better worlds and into the lives of people more interesting than you) while Someone reminds me of why I love reading in a different way (it’s beautiful, it’s lyrical, and it proves every life, even our own small lives, can be fascinating in quiet ways). Bookshelves hold books, which is good. We keep getting new books (or used books that are new to us), which is also good. Books hold memories. This can be good, or heartbreaking, depending on how much space you have to keep books around. Bookshelves offer an finite amount of space. That is the problem with bookshelves. Reading longer chapter books to Stella, my 3-year-old daughter, has been one of the greatest pleasures of parenthood so far. Though it is difficult to hold myself back to age appropriate material at times (can a 3-year-old handle Lloyd Alexander’s The Book of Three? Hmmm, probably not quite yet). We finished reading My Father’s Dragon trio , which was a pleasure, with amazing illustrations, though the first book was by far my favorite. It’s told in a never explained first person — the child of the father that goes on the adventure. It begins, “One cold rainy day when my father was a little boy, he met an old alley cat on his street. The cat was very drippy and uncomfortable so my father said, “Wouldn’t you like to come home with me?” Immediately I start to wonder why is the father not telling the story himself? How true is the story that the narrator is telling? What happened to the father? What happened the narrator? For me, it gets at the myth/legend making that we all do around our families and our family stories. Who hasn’t tried to turn their fathers into heroes by the stories that we tell about them? This narration frame brings up all sorts of complex questions that aren’t present in the later two books, which are just told in standard third person. 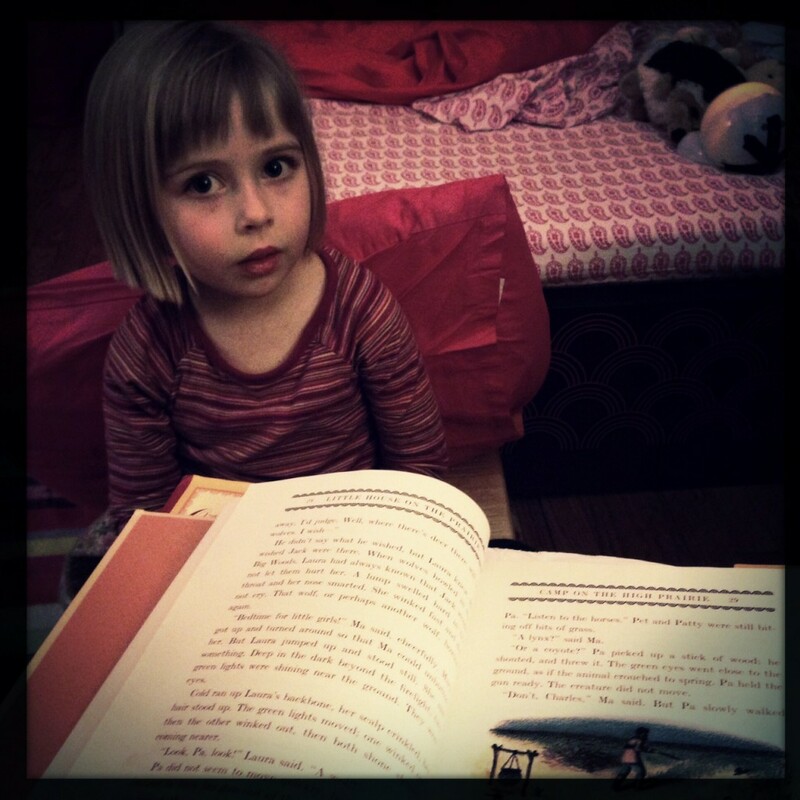 Stella is a generous reader and loved all three books.